LISTEN to Bob Irwin and Gina Frary Bacon of Sundazed/Modern Harmonic every MONDAY NIGHT on WFMU's Rock 'n' Soul Ichiban! Stomp to the sweaty jukebox snap of our fave 60's cellar-dwellers, Sunset-trippers, fuzzbox high-flyers, & much more! New shows every Monday at 8PM EST / 7pm CST! Get in the live chat with them for boss platter-banter!!! Big Planet Noise playlists - listen anytime! A time capsule of atomic-age country, radioactive rockabilly, and other-worldly melodies! Sheldon Allman (the singing voice of Mr. Ed!) brings you this long-out-of-print bunker full of plutonium-charged songs about space and destruction.Features ?Crawl Out Through The Fallout? as heard in the award winning video game Fallout 4! Modern Harmonic proudly resurrects this wonderfully mystifying LP! A true creative treasure, the Chicago born and Canada raised Sheldon Allman was a graduate of the Los Angeles Conservatory of Music. Known well as an actor, Sheldon also composed and sung the theme song for 60?s cartoon cult classic George Of The Jungle. Additionally, as the singing voice of Mr. Ed, he released a 45 of ?Pretty Little Filly? and ?The Empty Feedbag Blues." Most rare and coveted of his musical treasures was Folk Songs For The 21st Century, a concept album with a twisted futuristic outer space take on the atom craze. As an actor, Allman has over 50 credits to his name including films Hud!, In Cold Blood, and various roles on anything from Little House On The Prairie to the Twilight Zone. 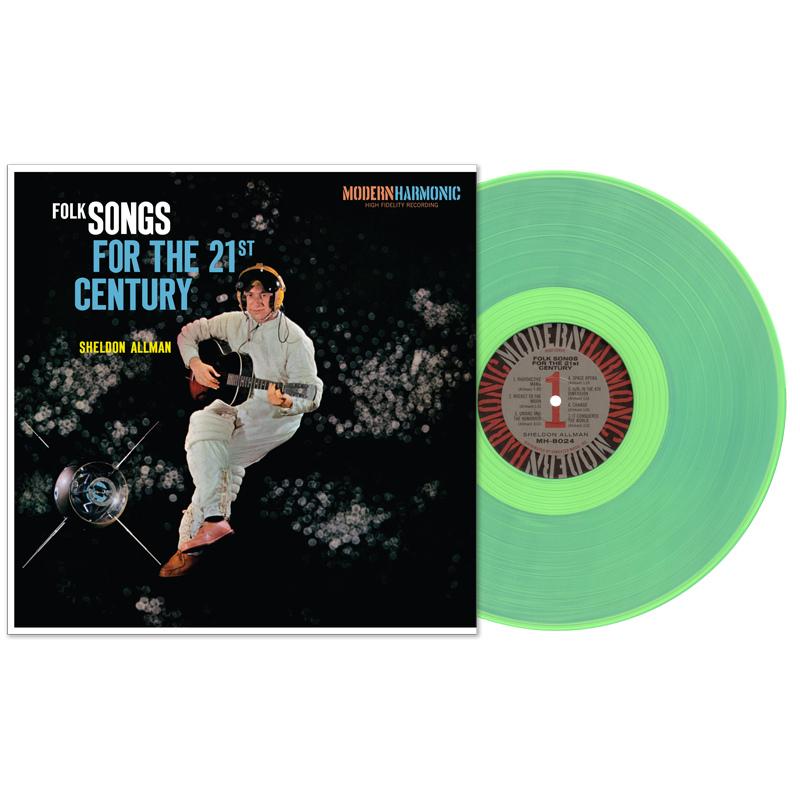 Modern Harmonic has taken this lost treasure and celebrates its eclectic rockabilly-ish uniqueness on plutonium green vinyl!! !